Sometimes it takes Ryan Buckley a flight in a light plane and a four hour drive across unmade roads to get to work. Ryan and colleague Tina Gill are training officers with Outback Stores, which manages 37 community stores on remote Aboriginal communities in the Northern Territory, Western Australia and South Australia. 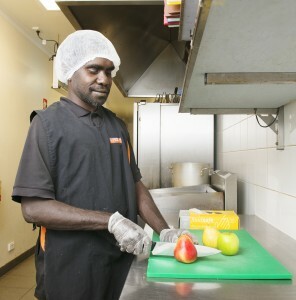 Ryan and Tina offer workplace training at small stores employing just two people at Epennara to large ones like Tennant Creek, with 72 employees. Outback Stores was established as part of an initiative to improve Aboriginal people’s health by improving the availability and amount of reasonably priced healthy food, drink and grocery items available for sale in local communities. 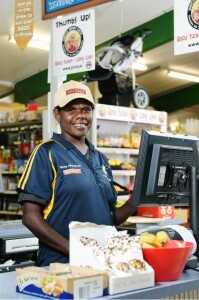 Outback Stores take on management and training at remote stores at the invitation of the local community, and in partnership with the community aim to run a fully stocked store comparable to that enjoyed by people in towns and cities. Sometimes this means establishing a new store or refurbishing an old one, improving shelving, refrigeration and retail equipment. It always requires training local people in the variety of tasks involved in storing, preparing, promoting and selling a much broader range of merchandise. The goal of staff training is to develop a workforce that will enable the community to take over and run a successful store themselves. Profits from the store go back into the community to invest in better equipment and community projects. Food in remote areas of Australia can cost 50% more than food in regional towns or cities. The cost of fuel, transport and refrigeration adds to food prices especially in areas where deliveries are affected by the weather. For example, during the wet season when roads are closed and food has to be flown in. By the time fresh produce reaches a community store, it is not only likely to be more expensive but far less fresh than it would be in urban centres. And if you’re not there in time to catch the delivery, you can miss out on fresh produce altogether. 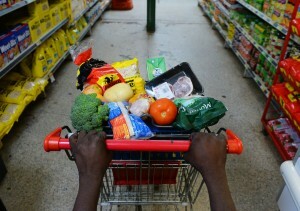 Not surprisingly, Aboriginal people in remote areas tend to buy cheaper food that lasts longer. But often it’s poor quality food, low in nutrition, high in salt and sugar. Outback Stores forms partnerships with suppliers in major food centres to supply more affordable produce to its stores. Having a remote community store stocked with cheaper and healthier foods means local people no longer have to travel long distances to shop and have greater choices when it comes to shopping. Store staff learn how to prepare and cook a wider and healthier variety of school lunches and takeaway food. Outback Stores training officers Tina Gill and Ryan Buckley offer Certificate II and III in Retail Service so staff can learn how to do a range of jobs required in different parts of the store. This includes food safety, communications, providing product advice, operating a checkout, preparing and selling takeaway food, replenishing shelves and organising displays. ‘It’s work-based training where people practise what they’ve been taught. We talk about the theory behind why the employee is doing something, show them how to do it,watch them doing it and then provide feedback,’ Ryan says. ‘No day is the same, it’s always different. I’m always learning,’ Tina says. ‘You know training’s been successful when you see a relaxed store manager, because you know that means well-trained staff where everything’s running smoothly,’ Tina says.